Overall, Imaging posted 11% lower sales and 19% lower operating income for the year. Nikon didn’t even manage to reach their February 4th forecast for the year that ended March 31st (“partly because of negative exchange rate impact”; note the “partly” ;~). 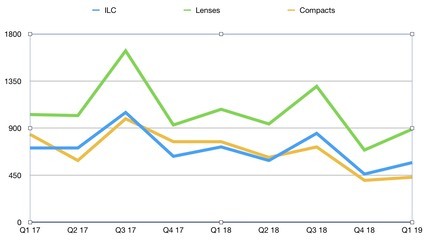 Indeed, every quarter was down year-to-year, but the last quarter shows Nikon sliding significantly down: their ILC market share is now down to just below 31% (note that Canon claimed to have shipped the same number of ILCs in that quarter as last year, probably gaining market share). Last year Nikon was just below 34% market share, so they’ve lost a solid 3%, or about a tenth, of their second place position to others. Remember all those articles I’ve written about switching, sampling, waiting, and last updating? The numbers are now starting to reflect the stark reality of that. And remember, Nikon has used bulk gray market sales to mask those effects, but they’re still showing through. But what I write about above would just be another “weaker” report. The headline says “grim.” What do I mean by that? Nikon is predicting another 17% drop in sales and 23% drop in operating income for Imaging in the next year. And that year starts with an wrenching drop: April through September 2016 sales are expected to be only 69% that of last year. This is attributed to market shrinkage, delayed launch of new products, negative impact of exchange rates, and the Kumamoto earthquake. In other words, higher-end products that cost more coupled with yet more cost reductions in the group. As I wrote: grim. Yet total sales dollars will only be 15.5% lower, and profit 23.5% lower. Short version: Nikon is going to sell fewer products at higher prices, and which have better product margins. Ironically, the Precision group is forecast with 43% more sales for the coming year. We’ve seen optimistic projections for Precision in the past that haven’t played out, so we’ll take a wait and see approach on interpreting that. But it’s no surprise that the company might be trying to re-leverage the semiconductor side of the business again as the most recent Nikon CEO comes from that side of the company and has now had enough time to realign upper management as he sees fit. Still, even if Precision grows 43% and Imaging drops 17% as forecast, the company would still be 52% a camera company. Weakness in Imaging is weakness at Nikon in general. And the new medical division continues to hemorrhage money. Still, Nikon is predicting slightly higher overall sales and profit for the entire company during the coming year, and that all hinges on how the Precision division does and whether the Imaging group really snaps back after October. And that last thought is the one potential positive bit in the report: the implication of the unit volume forecast for the Imaging group this year highly implies major Photokina launches (plural). I don’t know of a single product Nikon could come up with that would restore the numbers the way they’re forecasting; it’ll take multiple products. So if Nikon is confident in their forecast, we’ve got new significant products in the pipeline for the second half of the year. What might those be? The D610, D750, and D810 are all due for replacement. The D3300 is overdue for replacement. A D5x would be welcome to some of us. The Nikon 1 line failed, and any mirrorless re-launch might also produce the unit volume implied. One clue is in the somewhat higher lens forecast than ILC forecast, which seems to indicate a strong focus there. But still, this financial report was about as grim as it gets for an ongoing business that has been a strong #2 in its market for over a decade. The thing that worries me is not the product stream, but the customer support. Nikon has been cutting, cutting, and cutting costs. It now shows clearly to any customer. Moreover, the company is misfiring when it fires. The new ad campaign that spoke to social sharing of images didn’t get any traction at all given that the volume cameras that would have supported that are now delayed for six months and the one camera that does only works on Android. The latest sales promotions were cancelled early almost immediately after starting.